Are you taking enough time out in your life or is your day crowded with a to do list? To do lists, whether written down or just in our mind’s eye, can make life seem overly busy without time taken to just sit and reflect. Maybe we need to be re-connected with that quieter, calmer side of life. I'm talking with Mara Lyone who is an art therapist. It was a day where there were quite a few stalls about healing and the mind, but what struck me was a mandala made out of plant material on the ground. We talked about what is a mandala and how we would use it. 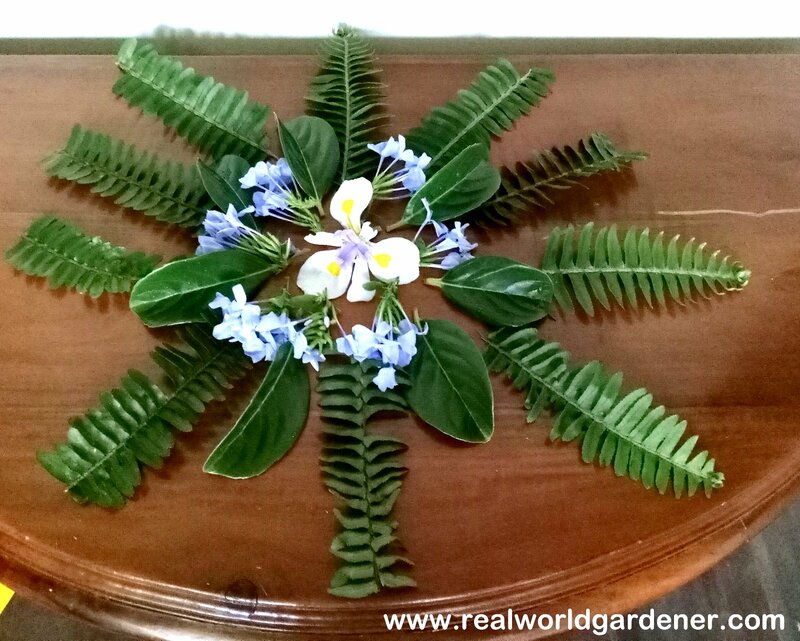 Gardeners often crowd their mind with things that need to be done in the garden without taking stock of what’s there. Mainly because often there is so much to do in the garden especially during the warmer months of the year. Pebble sculptures, beds of annuals, sculpted box balls in a knot garden are living expressions of art therapy? In planting, if you use secondary colours together, such as purple and orange or orange and green, or green and purple, they make wonderful combinations. Each of them creates a particular mood: purple and orange have red hidden in them, so there’s a great deal of warmth and energy in that. Gardening meets needs if you want to be a sculptor, or painter. And really, gardening to be the greatest healer of all. 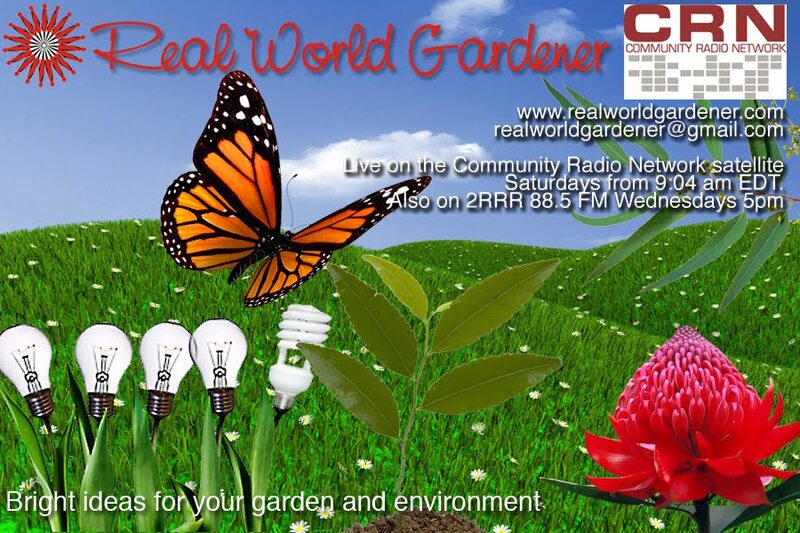 If you have any questions, either for me or for Mara why not email realworldgardener@gmail.com or write in to 2RRR P.O. Box 644 Gladesville NSW 1675. Okra: Okra is also known as Lady’s fingers. OKRA the way to pronounce is "Oh krah" not "Aukra"
It used to be called Hibiscus esculentus so that may you give you a clue as to what the bush might look like. Did you know that Okra is related to cotton, cocoa, hibiscus and Rosella plants? "Okra probably originated somewhere around Ethiopia and Okra is found growing wild on the banks of the river Nile. According to records, the Egyptians were the first to grow it as a veggie it in the basin of the Nile during 12th century BC . And as Okra made its way to North Africa and the Middle East, more uses were developed. Not only were the seed pods eaten cooked, the seeds were toasted and ground, and used as a coffee substitute (and still is). Another amazing fact is that in the 1800's slaves from Africa used ground okra as a part of their diet, and this apparently led to the use of ground okra seeds as a coffee substitute by other southerners during the American Civil War blockades of the 1860's. You might have also heard of a dish called gumbo. This comes from using Okra or gumbo as a thickener especially in soups. So what does the Okra bush look like? Okra varies in height from 60cm to 2m high depending on the variety of seed you buy. The leaves are heart shaped with plenty of yellow hibiscus-like flowers with a maroon throat. In case you don’t know Hibiscus flowers, think of Hawaiian or Tahitian girls with flowers in their hair. Might also be a Hibiscus or a Frangipani. As you know, after the flowers comes the fruit that looks like a five-ribbed small pod with a cap on it, sort of like a gumnut cap. Much smaller than beans or cucumbers. Pick these a week after the flowers emerge because the Okra, gets too tough and stringy after that. I’m told the leaves can be used as Spinach. In sub-tropical districts, you can plant them in August and September and then again January and February. Arid areas have between August and December to sow seeds directly into the soil. 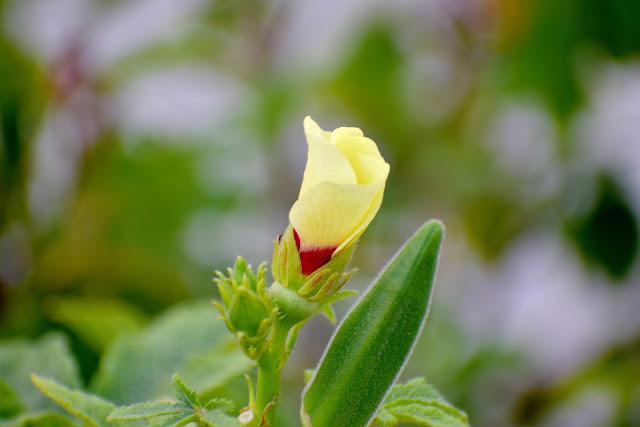 Cool temperate districts, including Tasmania, for you, the advice is to grow them in a greenhouse, but I discovered a blog from Adam whose from a cool mountain climate and Adam says “Okra does indeed grow in the cool areas, it just needs a bit of help to establish. Adam puts an old plastic milk bottle over the plant until it fills the bottle, then away it goes. Just pick the warmest part of your garden. You’ll get a small crop if you have a cold Summer, but should have heaps if the summer is warmer. Thanks Adam!. 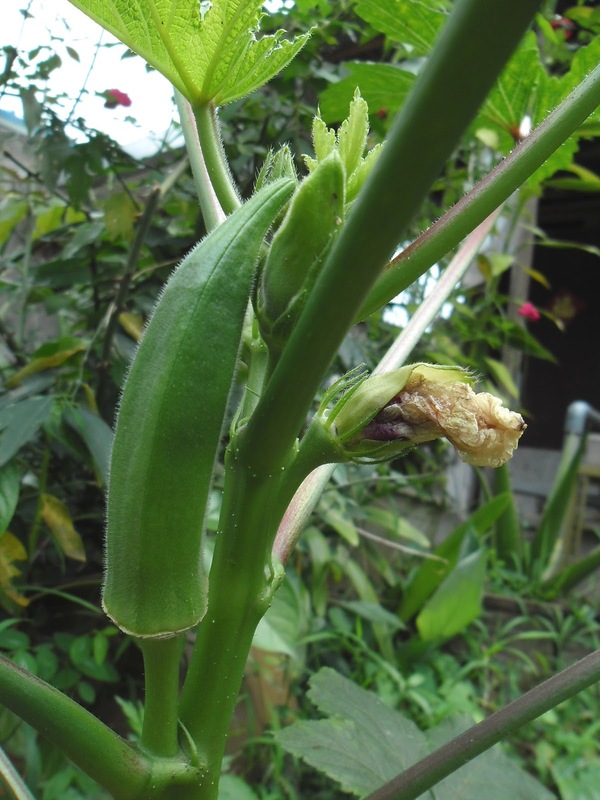 Finally for Tropical districts, you’ve won the jackpot this week, because you can grow Okra all year round! Okra seeds germinate reasonably well, but will be helped along if you soak them in a shallow dish of tepid water for 24hours. This will soften the hard outer seed coat. Pick a spot that gets full sun and has plenty of compost dug into the soil. One thing that Okra detests, and that’s wet, boggy soil or soil with poor drainage. Okra will also be set back if you get a cold snap in your district. Either sow the seeds directly or into punnets for later transplanting. I have heard that they don’t like being transplanted that much so you could try sowing them in pots made of coir, or make them yourself from newspaper or toilet rolls. A very permaculture thing to do. 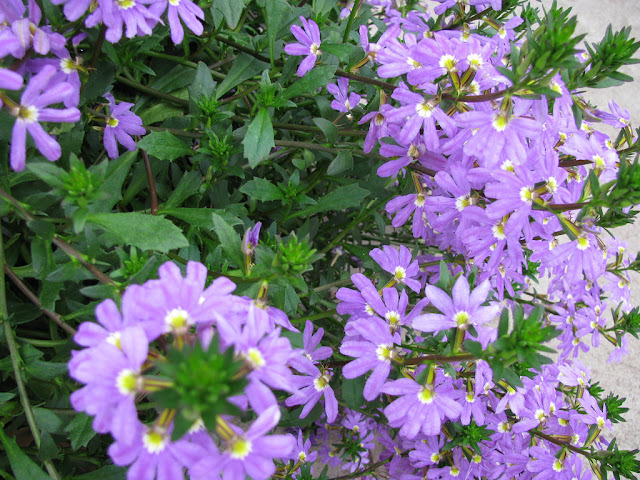 Because they grow as a largish bush, space the seeds or seedlings if transplanting, about 50cm to a metre apart. Water your Okra fairly regularly, and if your soil is too hard or clayey, grow some Okra in a pot no problem. TIP:By the way, Okra are partial to high amounts of Potash. During the growing period, water in lots of liquid fertiliser, such as worm tea and add handfuls of compost. 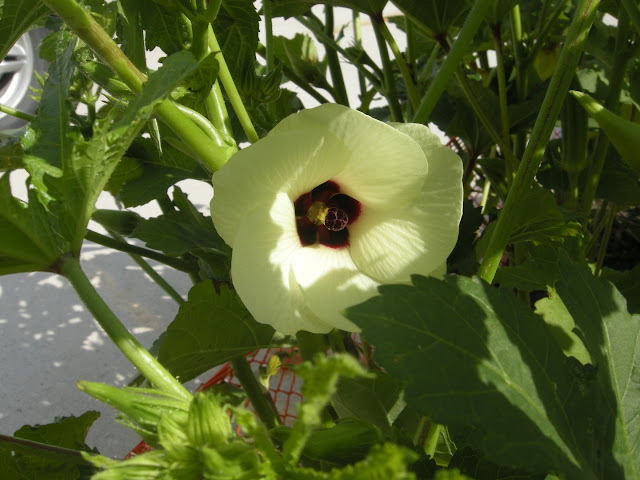 Tip pruning will also give you a bushier plant with more flowers and more Okra pods. In warm areas of Australia, your Okra will be ready to pick in 10 weeks. In cold temperate zones however, it may take as long as 16 weeks. Pick your Okra when they’re small and certainly before they get bigger than 10cm in length. Around 5 – 10 cm length is best. 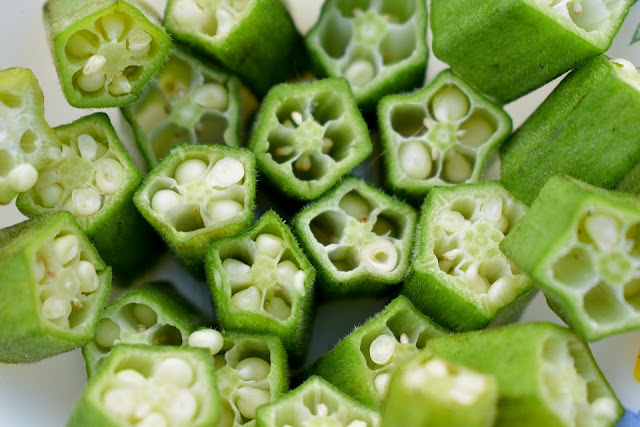 Tip: Okra pods are referred to as mucilaginous. What does that meant? Ughhhh! This can make them a bit slimy in cooking, so if that bothers you, don’t slice them, keep them whole. Alternatively, add a couple of drops of vinegar or lemon juice. I’ve also read that you should avoid growing Okra where you’ve had tomatoes, capsicums or potatoes growing previously. Two varieties I found online in Australia, are Okra Clemson Spineless, a bush that grows to 1 ½ m and Okra red Burgundy. Red Burgundy has red pods on a vigorous 1.5m tall plant with green leaves and attractive bright cherry red stems. I’ll put a link to this site on my website. You can get many rare and hard to find seeds at this company. Well priced too. Okra contains lots of valuable nutrients, almost half of which is in the form of soluble fibre, which helps lower serum cholesterol. A half of a cup of okra contains about 10% of the recommended levels of B6 and folic acid. By the way, Okra has black seeds inside the pod. Don’t feel you have to remove them because you don’t. The seeds add flavour to the cooking. The fibre is in that mucilage. How about trying a mix with peppers and eggplant! Or grill it on the BBQ! :) try it !! grill it on its side for 2 minutes each!its yummy!!!! Drought tolerant, salt tolerant, pretty flowers and no real maintenance. Wouldn’t that be good if most of our plants were like that? Never mind, even if we put some of these plants amongst the ones that aren’t so hardy, we’ll still have a show of colour and foliage when those others fade away. With those sort of credentials -let’s find out about this plant. That burnt hand story I’ve discovered was slightly off with the facts. 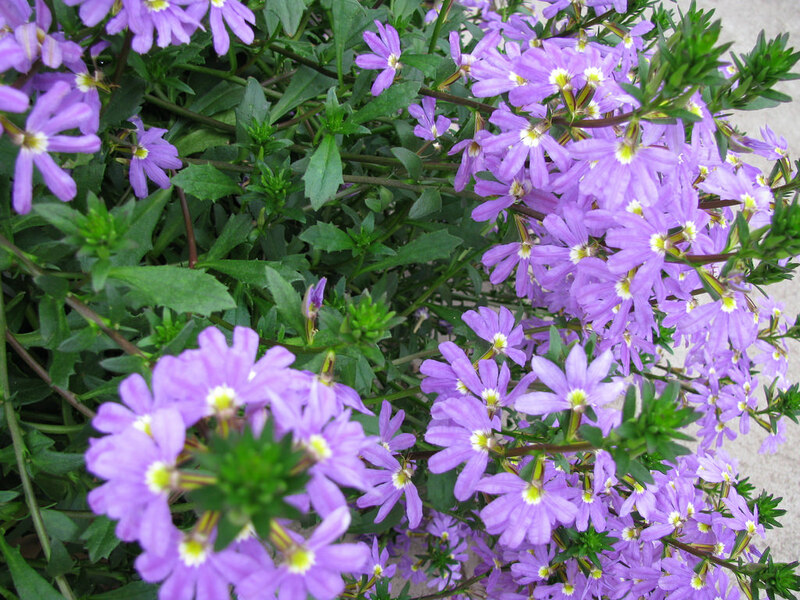 The latin word scaevola has a link to a Mucius Scaevola which was a lineage of patricians during the Roman Republic. It was an offshoot of the Mucian family started by Gaius Mucius Scaevola. This Gaius Scaevola was a legendary assassin who burnt away his right hand as a show of bravery during the early years of the Republic. Not saint at all then. These are all the methods we can use to not only make the flowers last longer in the vase, but to also make them look a whole lot better. Some plants with soft stems and heavy flower head, such as tulips and gerberas, are prone to bending. If left, the stem will remain in this position. To straighten the stems, wrap the bunch flowers in newspaper and stand them deeply in water for at least two hours – ideally over night. Others need to have their stems scalded in boiling hot water for a few seconds to prolong their vase life. These include roses, hydrangeas, poppies and sunflowers. Always protect the petals from the steam. 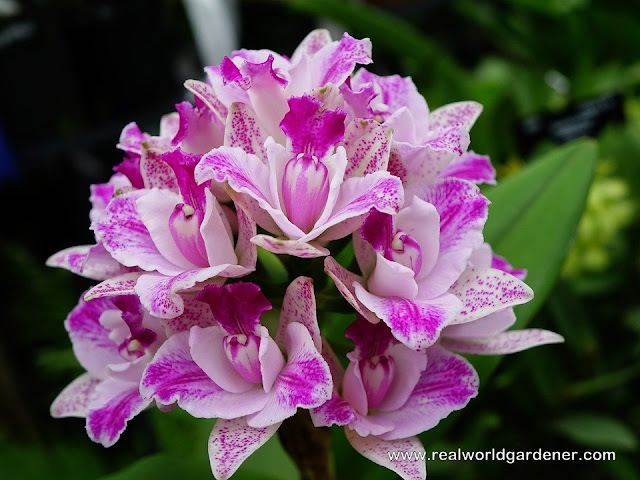 Misting helps the vase life of most orchids as well as camellias, bird of paradise and violets. Drowning in a bucket of water for several hours gives hydrangeas, roses, heliconias, christmas bush and viburnum flowers to go the distance.